Sometimes when you realize you need a new hat or mittens--It's going to be freezing tomorrow and I'm going hiking! It's my best friend's birthday and I don't have a gift!--you need it NOW! This is the book you can turn to again and again for just the right pattern, knowing that every project in it can be completed in a matter of minutes or hours. Designed for maximum style in minimum time, the knits in this book were created with busy knitters in mind. 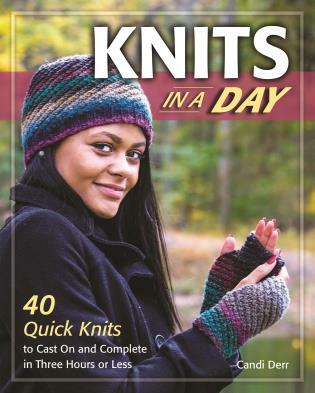 From twisty mitts to a family hat, a cozy alpaca scarf to cozy ribbed leg warmers, and a cable pattern that can be adapted to make wrist warmers, mitts, a headband, or a hat, you will have a quick pattern for every knitted essential in just this one book. Candi Derr is a craft book editor for Stackpole Books and the author of Knit a Vintage Christmas. When she is not working on craft books, she dabbles in a variety of fiber arts, including knitting, spinning, rug hooking, and crocheting. She resides in Mechanicsburg, Pennsylvania.